Is Space Curved? Can We See The Milky Way In The Past? It is mathematically possible for a universe to be shaped this way, but not our Universe. Our Universe is as close to flat as we can measure right now, though it’s only possible for it to be very slightly curved, considering the wiggle room we have remaining on our measurements. The universe that you describe could be round, donut-shaped or cylindrical; some shape where at least in one direction, it connects back to itself. These aren’t your only options for a universe - you could also invent a saddle shaped or other, more exotic shape to place your universe in. For now, let’s roll with a cylindrical universe. And let’s put a star somewhere on the surface. If the light from this star is going along the length of the cylinder, all it can ever do is go out, because the surface is flat in that direction; there’s no curve or loop. This flat, uncurved behavior is how we believe our Universe behaves in every direction. Light in our Universe departs its star, and travels in a straight line forever (as far as we can tell) unless it is intercepted by another astrophysical object, another star, planet, or telescope detector. However, the light that leaves our star in the cylindrical universe has one other option. The light that goes in the other direction - around the curve of the cylinder - will also travel in a straight path. But this path loops back on itself, and if the light doesn’t hit anything else, after it has completed its tour of the cylinder’s circumference, it will arrive back where it began, on the other side of the star, delayed by the length of time it took to do its loop. What happens if you make your universe spherical? It’s a very similar thing, except now every path that light can take will loop back onto itself, given enough time. There’s another curious thing about the light this time, though, which is that the beams of light, even though they’re all travelling “out”, will all cross each other at some other point on the sphere. If the star was on a flat surface, these beams of light would only ever get further apart; there’s nothing that would ever curve the light back towards each other. In our Universe, we know that there’s no bending of the light as it comes through space (this is from an analysis of the map of the oldest light in the Universe) beyond what you would expect from gravitational forces. This lack of a large scale bending rules out the spherical and saddle-shaped options, and all that’s left are the ones which can be considered flat. While we can’t observe the entire universe to objectively figure out what the global shape of the entire thing is, we know that on the scales of the observable universe, our Universe is pretty darn flat. How do we know that the Universe isn’t a tightly rolled cylinder? Well, we can’t rule out a gigantic cylinder, but it would have to be so large that we couldn’t ever detect a difference between light going “out” along the length of the cylinder and the light going “around”, because as far as we can observe, the Universe is the same in every direction. If there were a preferred direction, where the Universe appeared considerably younger than in the other direction, then we’d get suspicious of a cylindrical shape. But since there’s no evidence for that, we usually describe our Universe as an unwarped, three dimensional, grid. And with that kind of shape, we don’t expect any of the light from the distant universe to be taking a looping path to show us our own Milky Way. Why Is The Expansion of the Universe Always Drawn Like A Cylinder?  Why is the shape of the universe depicted as a cone? It’s true that while we had a long discussion about how the Big Bang was an even expansion of space itself in every possible direction, the diagrams usually give us a more directional vision of the evolution of the universe. It’s not just this one diagram, either, though the WMAP image is probably the most familiar – if you’ve seen any of these diagrams, it’s probably that one. The fundamental issue is that the Universe is an evolving four dimensional entity, and an artist has two dimensions to work with, and compressing by two dimension is really hard to do. Artists are pretty good at compressing three dimensions into two dimensions – we can imply a lot of depth with clever use of perspective. And in fact the artist who’s constructed the WMAP image is doing just that by giving you a cylinder of space, which we have all successfully parsed as “has some volume”. Here’s the issue: how do you draw and illustrate a changing three dimensional object? You can draw it at different stages, like a biologist’s illustrations of a jellyfish in different stages of life. You could make a video out of it, of course, but if your aim is to make an illustration, you’re stuck with a single image. The other option is to try and take a slice of the whole object, and show how that section evolves over time. It’s definitely incomplete, but it might give you a better sense of the changes going on, particularly if you can make the assumption that every other section you might have chosen is doing pretty much the same thing. This diagram, and the others like it are giving you a small slice of the universe to look at, rather than attempting to show the evolution of the entire universe, if such a thing were possible. This is a simplification of how the entire Universe has changed and evolved over time, but you could make a similar slice of any other piece of space that exists today – in tracing it back, you’d see the same sorts of changes. What if the Universe was a giant tiger surrounded by dinosaur bones? First off - this is a strictly incredible mental image. I hope you keep writing Mr. 5’s ideas down! Unfortunately, there’s no indication that our universe is in any way tiger-shaped. The Universe seems to be almost exactly flat in every direction - which means that if we were to get a spaceship with infinite fuel and shoot off in one direction, we would never loop back on ourselves or find the edge of the tiger; we’d just see a lot of universe that looks pretty similar to the portion of the universe we can see from the Earth. “What’s outside the Universe” is actually a really hard question to answer, because language often gets tangled up and in the way. The Universe is defined as everything that exists - all the matter, and light, and dark matter - all the stuff that makes planets and people, and all the energy and the space between them. Within the Universe is the only region where “space” and “time” have any meaning. The second complication is that it’s not mathematically clear whether or not the universe is finite in space. If it is infinitely large, the concept of “outside” the universe means even less - since there’s galaxies and planets for an infinite distance no matter which way you go. 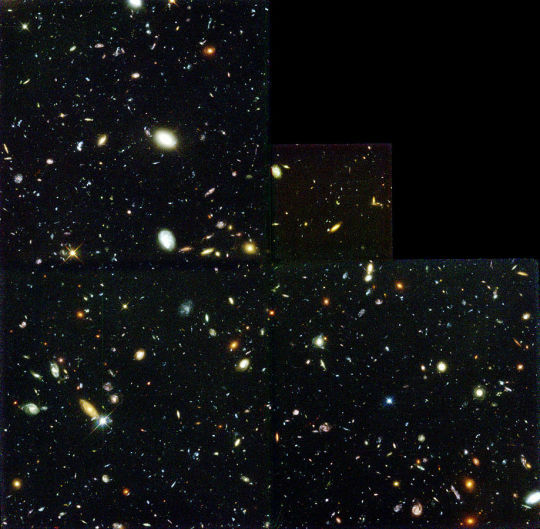 There’s no indication that there are fewer galaxies in any given direction, which you might expect if the universe had an edge, or stopped somehow. Often we just assume that the Universe is infinite in all directions because it makes it slightly less mindbendy. So, (tragically) no space tigers or space dinosaurs, just an awful lot of galaxies.